'Sensory Responsive Objects' were a series of works designed by Philippa Brock, Samuel Plant Dempsey and Priti Veja This collaboration brought together three researchers who had not previously worked together on textiles, but who all share an interest in smart materials. The collaboration has been as much about the process of the collaboration as it was the outcomes. Many ideas were discussed during the initial phases of the project, and the designers were particularly interested in exploring sensory experiences on the London underground – haptic, visual and sound for woven jacquard design. The designers discussed how these specific senses (haptic, visual and sound) respond and interact to sensory signal data on the London underground. Using the idea of contrasts for visual aids, tactility of moquette seat fabrics and platform blisters, and sounds of announcements, these ideas were further progressed into the design ideation phase using ludic methodology for design thinking. Visual contrasts to aid clarity and visibility are vital on Transport for London designs. 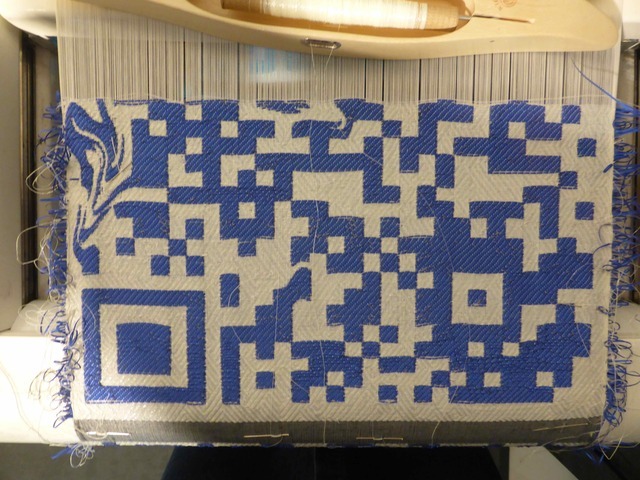 This jacquard outcome grew from how visual contrasts could be transformed as data, and led to the idea of QR codes (digital data as a visual response). The graphics of QR codes are usually a black and white code, read by a digital reader much like a serial barcode. The contrast between the dark and light space is what enables the code to be encrypted to a weblink. Generating a QR code for the @WeavingFutures twitter handle resulted in the visual graphic. Pattern manipulation in some of the idle code areas enabled swirl pattern aesthetics. 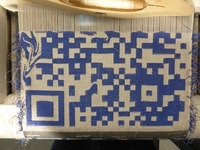 The QR code was woven in reflective yarn and phosphorescent yarn to give multiple visual contrasts effects depending on the lighting condition viewed in, while still working as an active code. 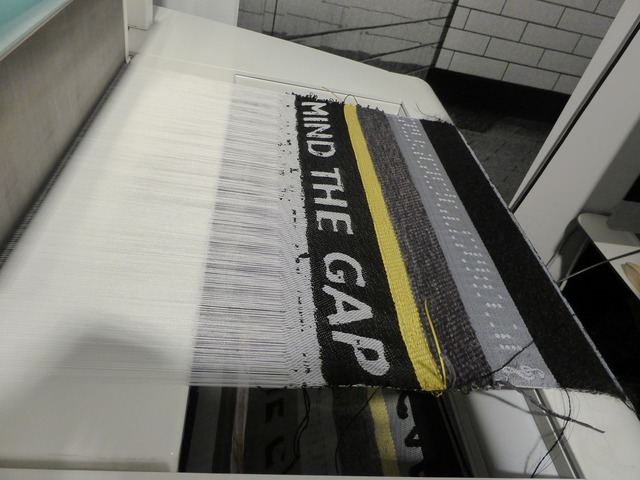 A photograph of the iconic ‘mind the gap’ text between the train and platform, enabled the designers to think about the multiple details integrated in this one image i.e. text, yellow boundary lines, paving indentations. Every detail served a purpose, thus the jacquard translation could also respond via multiple tactile materials (e.g. mohair - furry, polyester -smooth/shiny, matt chenille - soft/moquette like, yellow - reflective) while still keeping the ‘mind the gap’ text in a single woven design. This sample was a reaction to all the sound data on the London underground. When hacking the digibird and earphones, small speakers play an integral part of these functions. One of the physical qualities required for a speaker are coils of copper around a magnetic field. 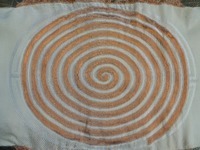 This could be translated as a literal spiral graphic and specifically designed structures, which would enable the piece to operate as a speaker. A giant coil was woven and requires connection to active sound source and magnetic field. In addition, this piece is also woven with a UV-reactive yarn to change visually when exposed to UV light. The digibirds were integral to inspire many trails of thought during the residency. The dissected digibirds enabled the designers to study the internal ‘guts’ and understand the methods of connections and actuation. 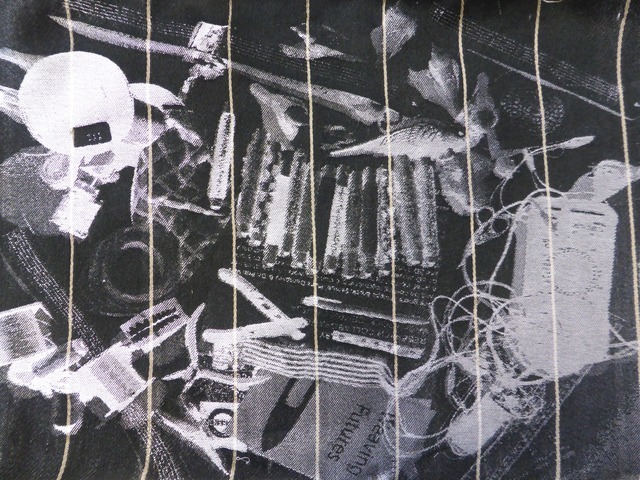 The visual photograph of the step-by-step dissection was used as the graphic for the jacquard design, with multiple tactile yarns. Disguised amongst the aesthetic design, multiple conductive yarn tracks were woven in to act as a fabric electronic breadboard. The piece is able to connect to a circuit of multiple electronic outputs to emulate to multiple outputs of the digibirds. The wind up analog music machine inspired this piece. The punch card system that operates the music machine requires holes to be punched in a specific sequence to play notes/ tunes. The visual aesthetic of the punched music card resembled that of braille, leading the designers to research and analyse the configuration of the braille alphabet. The 2 x 3 dot configuration that can make any braille letter could be reconfigured as a linear 1 x 6; hence, each braille alphabet letter could be translated as a punch card music machine sound/ note. Using this method, phrases from the London underground were translated as complete tunes, including ‘mind the gap’. 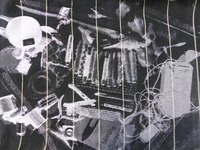 The visual aesthetic of this translated braille to music machine notes were woven as a jacquard design in this piece. The braille-music note hybrid coded dots were woven in structures that enabled raised surfaces, relating back to the original haptic of braille.